The garden is looking really pretty right now, there are plenty of flowers in bloom, and the birds, along with their babies, have been visiting the feeders all week. Here's what's happening in the garden this late May. The Bachelor Buttons in the flower bed are still producing beautiful blooms, the snapdragons have opened up as well, snapdragons are one of my favorite flowers and I have them all through the garden, they often plant themselves and survive the winter, so we have some mature snapdragons from last year as well as some new ones. I also added petunias to the bed to help it fill out a bit. Some volunteer mystery squash has popped up in the bed where I had squash planted last year. I took out most of them but I may leave one of these just to see what they are. Otherwise in this bed I planted some mini pumpkins in both orange and white. I really wanted to grow a larger pumpkin last year and they just didn't do well, so I thought I would try the tiny pumpkins again. Around the boarder of the bed I planted some Walla Walla Onions just to see if they would grow here, if they do, that would be great, they are a Pacific NW favorite! Most of my peppers are doing great except this twiggy little one which the flock of Starlings got curious about and plucked off all the leaves, they left most of the peppers alone except two, one has come back, but this one isn't doing well. I will probably be replacing it or planting an Anaheim in its place. 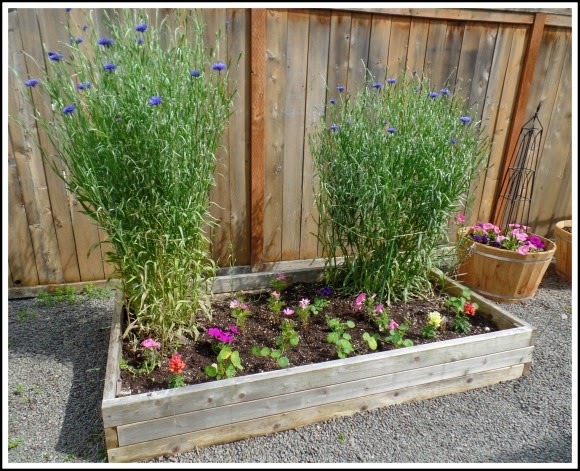 The herbs are doing well, the chives, thyme, and sage are all blooming right now which makes the bees very happy. 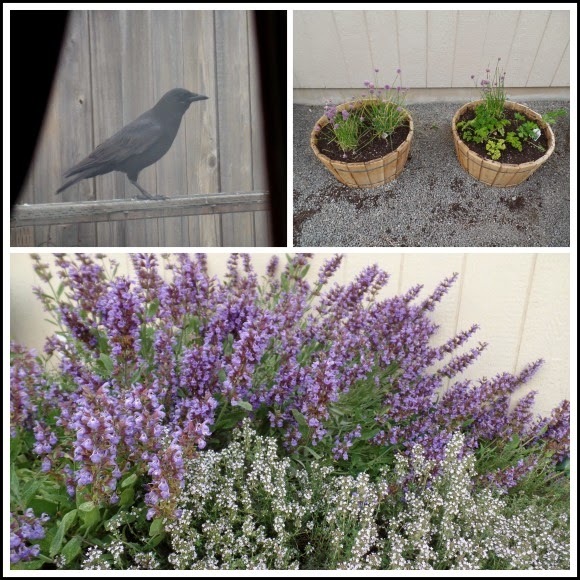 I love the purple sage flowers! I re-potted the chives and gave them a bigger pot so they could spread out more, I also re-potted the parsley and planted some new Italian flat leaf parsley. The crows have been visiting the garden regularly, they don't get into the veggies at all, what they are looking for are crackers that I have been putting out for them. They are very shy, so I can only get pictures of them through a small opening in the curtain. I am hoping the crows will be regular visitors, I have heard stories about crows leaving shiny little gifts, like beads or metal bits they find, in spots where they get fed, I think that would be pretty neat. 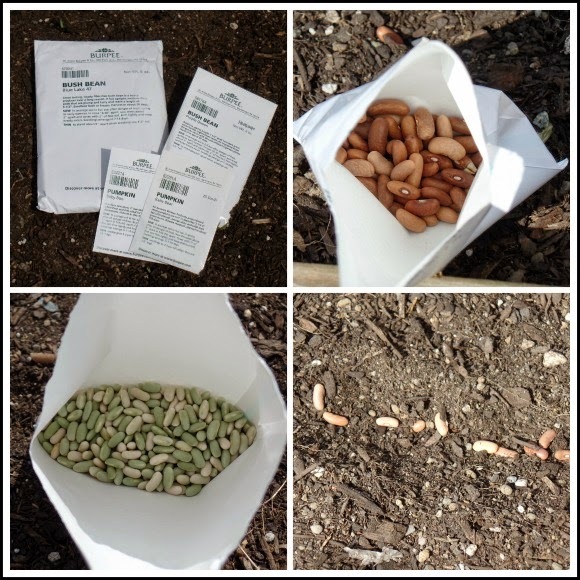 Just like the last few years I am planting two varieties of green beans, one green, and one purple variety. They are a summer favorite around our house. 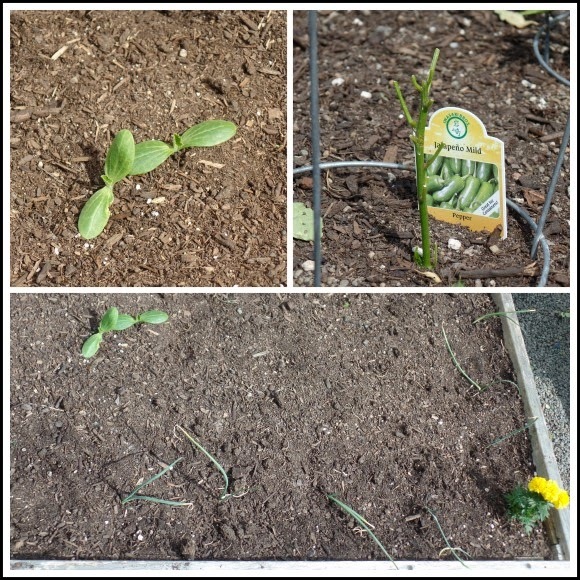 I also planted golden summer squash and zucchini. So now the garden is all planted and ready to tend to this summer. The starlings have had their babies, and my are they a noisy bunch! They have been going through one to two suet cakes a day, as well as a feeder and a half worth of seed, and any bread I put out for them. The babies are so cute, they are learning how to feed themselves, but seem to prefer their parents to feed them, and they definitely let them know. 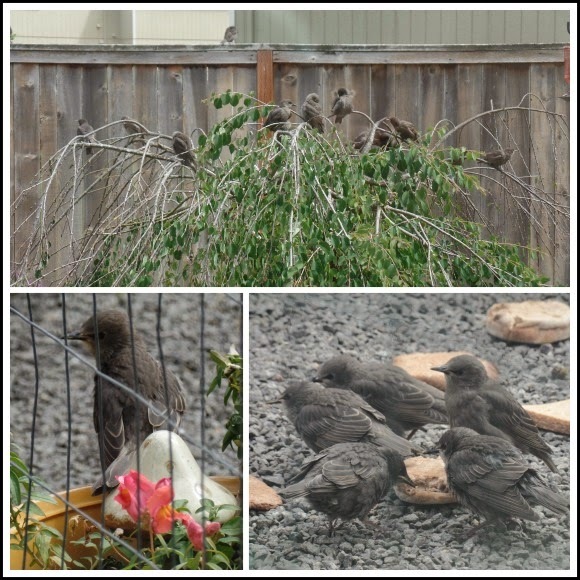 All week I have able to watch the baby starlings being fed, they are nearly as big as their parents but a little fluffier and sort of a gray-brown color. They have been perched in the Weeping Katsura tree for most of the days, as well as hanging out where I put bread down. Although loud, and although they ruined a pepper plant, I really enjoy watching them. This week I got to see them respond to the Kestrel in the area behind our house, which for one afternoon was actively flying over head pursuing the little birds. 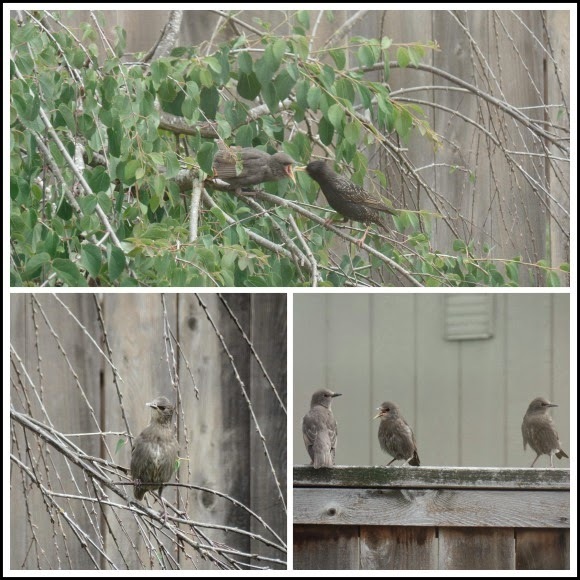 Just before he would fly over, the starlings would somehow know he was nearby and take off all at once along with the babies. The kestrel in flight is quite a beautiful bird, although I'm sure the Starlings and my other little birds don't think so! One day last week I was bird watching and all of a sudden in flies about five large birds, the likes of which I had never seen. They looked almost tropical and I quickly grabbed my camera to snap a few pictures. They were as big as the starlings roughly, and very beautifully colored. 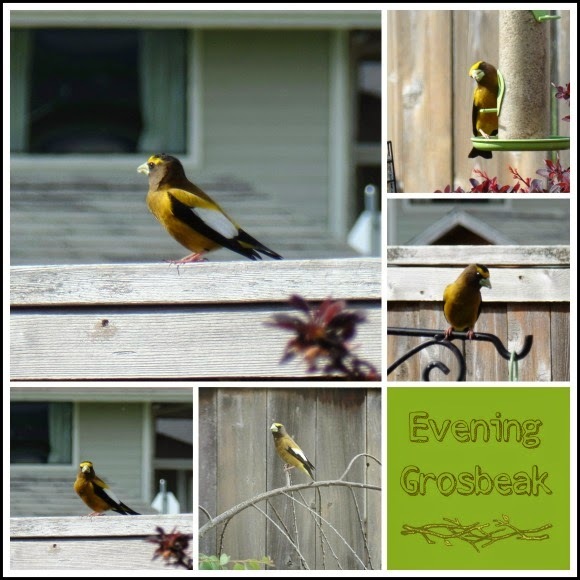 Sort of an olive green yellow, with black and white, and a bright yellow across a very large light greenish beak. I was so excited to have a new bird in the garden! 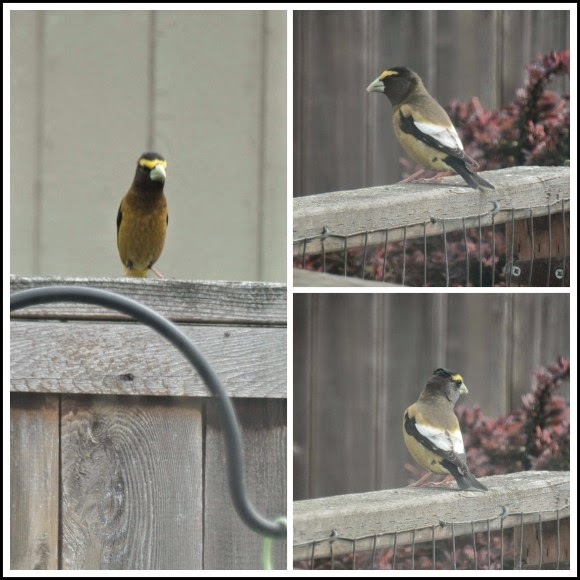 Of course with its distinct markings and beak it was very easy to identify after flipping through my bird book, and I found out that they were Evening Grosbeaks. I had heard of this bird, but always thought it was smaller like a finch. They have been back to the bird feeders multiple times this week, and it has been fun watching them. Aren't they beautiful? It is definitely the year for more birds in or around our yard, we have a Great Blue Heron that flies over head lately as well, I usually see them on the outskirts of town or in the surrounding countryside. But last week we spotted a beautiful huge heron in a little pond that is a couple streets over. Now I see, presumably the same one, flying overhead headed in the direction of the little pond. 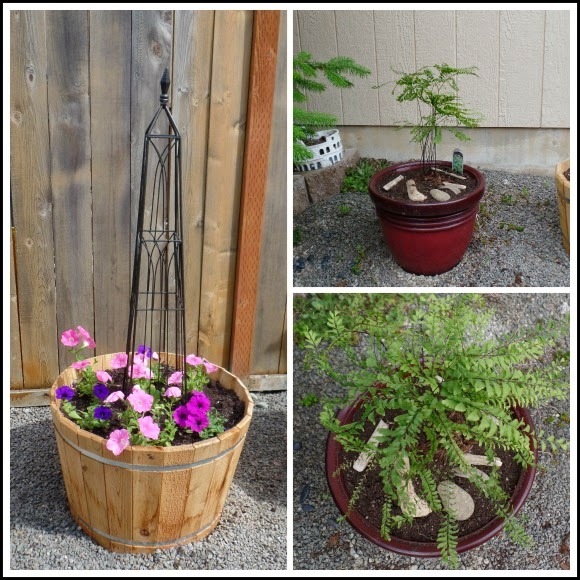 So that's whats been happening in our little garden this late May, it has been a beautiful month out in the garden! You do so much with your little plot, April! It is encouraging to see. You are doing a wonderful job of feeding the birds. I just planted a katsura tree last year! Do they really smell like caramel? I agree.. you have a lot going on here. Your garden looks wonderful. The birds are nice to watch. WE have some fiesty Mockingbirds...that get after the Blue Jays. they make quite a ruckus! Now... I am just seeing that your left a comment on my blog, but you are one I don't get notifications for. Sorry about that. I don't know why that is happening to some of my readers... I'm trying to stay on top of it. Hopefully, now that I've switched to moderating ALL comments, I get some type of notification and we'll be able to visit more!